Mother’s Day - "IMPRESS MOM"
Pamper your mother with a memorable meal using methods which will transport her on a journey of creativity. After all, all she ever does is spoil you. Create this gastronomic experience in your home. A welcome, ice-cold, glass of refreshing, fruity flavoured tea will be received warmly. Tea’s full potential is often overlooked as many only know it for its “hot cuppa” properties. The savoury kick from a Caesar salad is a great start to any meal as it stimulates the salivary juices. Over the years this dish has evolved into a typical everyday table salad. Disgraceful, if you ask me! This is a grand serving of food that was created in 1924 by an Italian chef, Caesar Cardini, at a restaurant in Tijuana Mexico. It was traditionally prepared at the table, with the greatest attention to detail and, today, it should be made with respect for its longevity. Interestingly, the original recipe was without anchovies… which suits me perfectly. The crisp romaine lettuce leaves, crunchy herbed croutons, salty capers, rich-creamy dressing and finely shaved parmesan makes this my favourite salad. The textures excite my palate. I often add sautéed bacon and onion or sliced sesame chicken breast or smoked salmon to this enticing salad. Scrumptious. 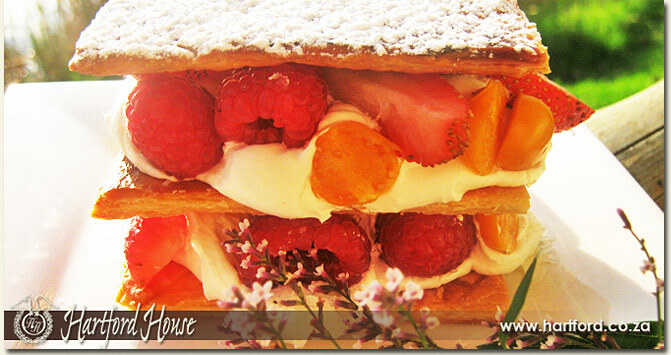 Mille Feuille, when translated means “a thousand leaves”, is a classical dessert consisting of thin layers of puff pastry separated with layers of custard or Chantilly cream (flavoured cream with vanilla extract and castor sugar) and fresh fruit and/or berries. With the variety of fruit available this is the ideal dessert to round off a delectable lunch. Mothers of any age will enjoy this menu for its use of traditional flavours and, at the same time, it's originality and freshness. Mom’s day off will result in the whole family’s culinary enjoyment. Bon appetité. Take these recipes and try them. Post your comments and food-related questions below.